Meet open to all Potomac Valley Swimming registered athletes age 10 years old and older. PLEASE MAKE SURE YOUR ATHLETES ARE REGISTERED FOR 2008 BEFORE ENTERING THEM. If entering an athlete into the 1650Y Free with a 1000Y/800M Free time, enter your athletes based on actual time showing course swum -- do not convert. Please mark swimmers entering with 100Y/800M times as exhibition. The meet will be seeded and swum according to submitted entry times regardless of age. Heats will be swum fastest to slowest, alternating Women and Men. 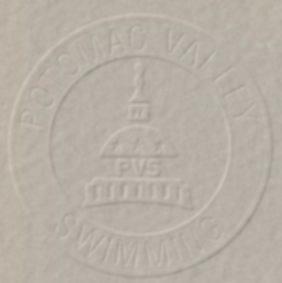 Expected swim times, and check in requirements will be posted to the PVS Web Page at www.pvswim.org no later than Wednesday, January 3, 2008. All certified officials wishing to volunteer to work this meet please contact the CUBU Officials Chairman, Art Davis emerand@comcast.net prior to December 21. Please include your club affiliation, certifications held and sessions you wish to work. Officials volunteering should sign in at the recording table prior to the start of Warm-ups. Certified officials who have not previously advised of their availability may volunteer their services to the Referee at this time. Warm-up: 7:00 - 7:30 am First Heat: 7:40 am. Each swimmer must provide his/her own timer (required) and if desired, a lap counter.